Strictly speaking, Tom’s Drums is not on Denmark Street; occupying three floors of a late 19th century brick building at the western end of the street, its address is actually 126 Charing Cross Road. While most of the shops on the street are focused on selling guitars, Tom’s is in the unique position of being the only place to buy acoustic drums. However, Tom’s also sell guitars, and Colin Burns looks after that side of the business, in parallel with running his own guitar repair business in the basement. Colin is yet another former employee of Andy Preston, the owner of Andy’s Guitars at the other end of the street. There is something of a pattern emerging here. Indeed, in 2006 Tom’s Drums rose from the ashes of Andy’s Drum Centre, which was run by Tom Wilkinson at 25 Denmark Street. Today, though, Tom Wilkinson has retired and the shop is owned by Andy Preston’s former accountant, Stephen Bourke. In the 1970s I was first trained at Fylde instruments in Lancashire. My sort of history since with the guitars is largely down to the fact I did that time at Fylde. I trained there in how to make acoustic guitars. Everything else that’s happened is probably largely Roger Bucknall’s fault. I blame him for all of it! Bless him. I went from there to doing some repairing at home in Liverpool, where my mother lived at the time. Then I went to manage a repair shop for Chris May and Andy Preston in Newcastle. I went and worked there for several years. Well, they sort of parted. Chris carried on with Overwater [still making basses in Carlisle] and Andy moved me to the shop in London. That was how in the early 80s I ended up in the basement at the other end of the street. There were three or four people working there. [Mal and Fiona Miles] had done some sort of course in instrument making and repair down in Wimbledon somewhere. They were there when I arrived. It was busy then. The street was a lot busier in the 80s as well, obviously, than it is now. I think Graham [Noden] came about a year later. When he arrived he already had quite a few clients obviously, because he’d been established for ten years. As I recall it, late 60s early 70s, there were music shops on Shaftesbury Avenue and coming up Charing Cross Road from Shaftesbury Avenue. Jim Burns [of Burns Guitars] used to haunt the street in the 1980s. He would quite often come into Andy’s. Round about 1985, ’86 I started being asked to go off on the road and tour as a live guitar technician. I ended up doing eleven years with The Kinks, a tour with Dexy’s Midnight Runners, worked with the Manic Street Preachers, worked with The Beautiful South for thirteen years. Steve Hackett. So quite a lot of people you’d have heard of. Obviously it was a great life. I got to see an awful lot of the world. Most of what you hear about crew and musicians after hours and backstage and off duty is all true [laughs], and rehabilitation has been sought, professional help has been sought. No, it was the best job in the world, particularly working with The Kinks. Stressful, but ultimately very worth it. I could unhesitatingly pin my colours to that mast because I was a huge fan when I was a kid. I was a fourteen, fifteen year old when I bought my first Kinks record. I was in my mid 30s and I got to meet them. It was strange, it was like, wow! The other thing I did with The Kinks, actually – we did a radio broadcast going out in America. Basically, we used Jimi Hendrix’s studio, Electric Lady in the Bronx, brought a very small audience in and it went out on the radio. That was a big one for me, being a huge Hendrix fan. It was great just to spend the day there. My time with The Kinks was 1985 to 1996, the last show they ever did. I’ve some of the tour laminates up there, and I’ve still got the set list from the last ever show on my guitar case. That stand that holds those guitars, that went round the world with me as well. People say that Ray and Dave can be difficult, but they always treated me great. They always treated me really well. [I was with the Manics] the first year, when they were still a fairly punk band. That would be [when they were on] Heavenly Records. I can remember we did a lot of fairly small, five- six-hundred seater clubs and this was virtually almost as soon as they’d come out of Blackwood. I think they’d only ever done a couple of gigs at their local church hall in Blackwood and then sent a load of tapes out to various people, one of whom was All or Nothing management and PR company. I worked with the same people with The Beautiful South. The people who were the Manics’ management were The Beautiful South’s press people. The Beautiful South were on Go! Discs from the word go because The Housemartins were on Go! Discs. The Beautiful South didn’t really need to go looking for a record deal. By virtue of The Housemartins being the biggest thing on Go! Discs they already were accepted right away. I worked with them basically from the first tour. Touring the first album, so the first gigs that they did when they put the full band together with a horn section and keyboards and everything. Straight into filling out two, three thousand seaters. They were quite shocked, actually, by the level of interest in them. They hadn’t expected it to take off that dramatically. It’s funny, an awful lot of people know their songs, but don’t know who they’re by. Still, even now. I had a great time working with them. I did a lot of the album sessions, setting all their equipment up for the recording. That was the other thing, I did actually get to spend some time in some incredibly good recording studios and learned quite a bit along the way in that respect as well. Places like Air No. 1 in Oxford Street. Fantastic! I was loading Beautiful South’s equipment in just as Dire Straits’ stuff was coming out. A fantastic studio, a brilliant live room. And then all of a sudden, one day The Burton Group decided they didn’t want it to be a recording studio any more. It’s probably an office now, which is just absolutely criminal. Then Air had to move to Hampstead. I’ve not been there since. From the mid-80s to 2003 I suppose I did a lot of touring. Practically nothing else, I wasn’t working as a repairer at that point. Just enjoying being above ground and actually getting to see a bit of the world. It was great, before I finally decided that I’d better start bringing my kids up, spending a bit more time at home. I went back to school for a bit. I got myself a National Diploma with a triple distinction for Music Technology, based largely on the fact that I’d been in the music business for years by then. I’d actually learnt something by then. And then I did a Media Practice foundation degree, largely camera work and digital editing. That’s what I was doing immediately before this. I came back into London to work at somebody’s shop as a repairer, but as the opportunity came up I ended up here with my own repair shop and then as the months went on getting more and more involved with the shop. The two things go side by side. I’m doing the odd few live gigs but mostly running the guitar department here. I do a few days of each and it suits me perfectly, because the repair side of it never becomes like a production line. It’s just enough to keep me interested without it becoming too much. It’s separate from the shop. More and more I’m ordering the guitars in, running the guitar side of things. Ordering all the accessories, keeping all that together, basically. And learning more about the drum side if it as I go. Obviously, having done twenty years on the road I learnt a fair bit about a lot of other musical equipment, not purely guitars. A lot about keyboards, microphones even, all of that side of it. So, all of it’s come into play and all of it’s been useful as I arrived back here. Where I caught up with them; they had had something on an upper floor I think in Wunjo’s, the guitar shop down the street. They’ve been in various locations but they ended up in the bit at the bottom of the stairs here, the lower floor. Chris Bryant had the upstairs part, the guitar side of it and they had a drum specialist part downstairs. They came in one day and Chris Bryant had left, taking all his stock with him, so they turned up to an empty shop. This must be round about maybe just over two years ago. The landlords then advertised – a big sign in the shop window: ‘Premium – To Let’ and nobody in the street, for reasons that I still don’t fully understand, nobody in the street even enquired. By default, Tom’s Drums ended up taking over the whole store and probably about three months after that I turned up and through various people that I know, we started putting guitars in. It wouldn’t really have survived purely on drum stuff. It needed to become a bit more all-encompassing in order to pay the bills once they’d taken over the whole building. For every drummer, there’s usually two or three guitarists, so the odds are against you as well. I think we are now, and we do keep that side of it up very much and I want to push that side of it even further. There’s nobody else in the street doing acoustic drums now, we are literally the only one. There’s only us and Footes in the West End now that are doing any amount of acoustic drums. Rose Morris did for a little while, but have stopped. We’re hoping to push that further and expand it really. Of course, we still don’t really know how long we’ve got here or what’s going to happen. Everybody’s lease has a clause in it that says they can get you out in a few months without any explanation or for any means that suit themselves. I think everybody’s lease is very similar if not the same in that respect. What I am hearing is that a lot of the shops in the street will end up going. I am also hearing that because we are technically on Charing Cross Road, we are safe. That’s what I’m hearing, but then again in the course of the last year I’ve heard just about every conceivable story about what’s going to happen. I heard its opposite within weeks. There’s an awful lot of conjecture, an awful lot of hearsay and nobody really seems to know what’s going on [laughs]. That’s the impression I get. We hear different things all the time. We’ve had a lot of film crews and a lot people coming down the street, bringing attention to it, which is great, but as I say, until we get a little closer to the Crossrail being built and all this building work being done I don’t think anybody’s going to know exactly how far it’s going to go. [Rent is] the question that’s hanging over everybody. What I have seen, and because I worked here in the 80s and even last year, what they call the footfall, just density of people on the pavements… I’ve never seen the street, and even Charing Cross Road, look this deserted. It’s very quiet and has been for months. It’s hard to say, because we’ve had several things happened in January. We lost the Enterprise Centre, the big rehearsal rooms. That’s had a bearing – an awful lot of musicians don’t have a reason to come to the street any more. That’s gone. The 12-Bar went within a couple of weeks. I think they went virtually at the same time. There were those two things happen in January – the 12 Bar shutting and the Enterprise Centre shutting and then virtually at the same time the Central Line stopped stopping at Tottenham Court Road. All of those things happened at once and I can see a big difference between the number of people down this end of town compared to this time last year. It was probably nothing compared to what it was like in the 80s and 90s, but it was still a lot better last year than it is this year. People’s habits take time to change. People have got their little routes and their little places to go for things. Taking that into account, it won’t instantly come back. It’s not that simple, unfortunately. People tend to be creatures of habit; it will be quite a while before we can get that amount of people back. Well, my boss [Stephen Bourke] was part of Andy’s. You must be aware, Andy started the 12 Bar as an after hours drinking club for his employees. By that time I had just left and gone on tour, otherwise the 12 Bar would have made a lot more money instantly at that time. He was in there wandering around in there. He went to have a look for old times’ sake. He met his wife when when she was working at the 12 Bar for instance, so it’s got history for them. That was the day it closed, so that’s a little bit of history in itself. That was the very first sign, I think. The one that Andy had done way back in the early days. For several months at the beginning of 2015, Tom’s Drums was forced out of its premises by a massive flood from above. As we heard it, it must have happened on the Saturday night. The first I knew about it was one of the guys came in at midday on Sunday to open up and the front part of the shop was fairly dry. Everything in the back part of the shop was completely soaked. Completely soaked. What they said was it had been an unoccupied but recently refurbished flat, three floors above. So it took out two flats and two floors of our shop. Even downstairs here, water had come down through the walls, down through the ceiling. The first thing I did was start taking valuable drum kits apart and drying out every piece of hardware, every shell. Annoyingly enough, everything in my workshop stayed dry, because I’m actually under the pavement, I’m not actually under the shop. My little bit of the chaos stayed dry, but everywhere else down here took pretty much a direct hit. A lot of the stock upstairs was ruined. We’ve really only just got the insurance sorted now, six months later. We had to move to the old Foyles building over the road while they were refurbishing this place, in the course of which we got an attempted break in, an actual break in. We ended up having to have overnight security guards of our own in there. Luckily it all timed out just when they were finishing the work here. We looked at other places, but figured that we were better off here, really, in the long run. It’s very disruptive to the business, extremely disruptive to my business. It’s taken a long time to sort out. It’s set the business back, certainly, but it’s stabilising now and it’s getting better. Again, you tend to forget that people sometimes don’t come up this area for maybe two or three years. They expect everything to be exactly the same, so we get people coming in thinking it’s still Chris Bryant’s shop from three years ago: ‘I left a guitar here two and a half years ago…‘ Mmm, no. Likewise, if they came up here when we’d moved out, they probably think we’ve gone and will never be back. It takes a while for it to sink in for people. It’s beginning to stabilise now, but it did have a hell of an effect. For one thing, we were closed for business completely for about four weeks between the day when the heavens opened and the day when we actually got moved over the road. I mean of course the Internet’s had a big effect on this, but I think when it comes to musical instruments and particularly guitars, people tend to want to try them. They don’t just tend to want to look at it in a picture and go ‘Oh, yeah’. They tend to want to play it and try it and see if they’re comfortable with it. You’re aware that some people are doing it, that they will come in and try instruments in your shop and then they’ll go away and buy them online because they can get them that bit cheaper. So we have to be aware and keep our prices to about what they are on the internet, but taking into account that those prices won’t include postage. We have to keep ourselves competitive, so if they come down the street and buy a guitar it’s not going to cost them any more than it would if they got it through the Internet. To be in the running at all, you have to do that. I believe GAK looked at whether it was feasible for them to have a store in Denmark Street and came to the conclusion that it wasn’t. They couldn’t have kept their own prices. They couldn’t have kept uniformity of their prices and paid the overheads. That would have been totally impossible. It’s still one of the few places where there are a bunch of independent shops that aren’t just chains like Music Room or GAK. Obviously the advent of the internet has had an effect on it. The numbers of people coming to the street is the biggest difference, really. A lot of the shops are fairly similar, have maintained the same size or have grown, in the case of Wunjo’s expanded to a few different shops. I know the PA Centre’s gone now. They had another sort of Bass Centre, Keyboards and a PA Centre at one point, so that’s gone. People tend to come into the street, they’ll come to us first and then if we haven’t got it they’ll go elsewhere, but if we have got it, they won’t bother with the rest. It’s probably the best pitch for a music shop in Europe, I’d say. Certainly in this country I can’t think of any that are better, really, where you could be. 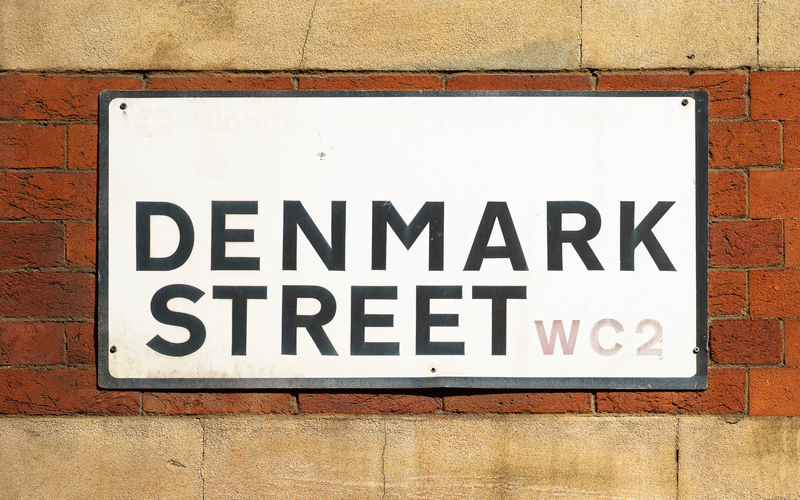 As long as we retain some of Denmark Street, obviously; as long as we still have a Denmark Street in fifteen years. [We’re stocking] a fair bit of everything second hand, but there’s areas that we can’t really compete with. The Street has got vintage guitars sewn up pretty well. What I’ve tried to do since I’ve started here is address not just entry level, but fairly much entry level and just above, up to about eight hundred quid. As that’s now stabilising, we can move up, but we’re in a strange position in as much as we’ve got the Gibson dealer just down the street, so we can’t get them. We’ve got the Martin dealer and the Taylor dealer just down the street, so we can’t get them. So it’s like ‘See what you can do if you’re not allowed five choices of guitar manufacturer.’ That’s what I have to do, basically. We’ve got Cort, Crafter and Yamaha, Ibanez, Countryman as well. That’s pretty much the bread and butter side of it, along with a lot of accessories, a lot of ukeleles, which are very popular. Being a guitar person, I think it’s just a fad that hopefully will blow over. I’m intending to make some high quality small guitars just to try to redress the balance to be honest. It’s just another tribute to convenience culture, isn’t it? It’s so much easier to carry this little thing around. I’m very much a believer in that I do try to keep half and three quarter scales both for small people and for beginners and for children. I think it’s important and I can well remember when I was growing up you were presented with a guitar that might be virtually unplayable because it was cheap. Because you’re new to it, you don’t know any different and a lot of people, I think this is unforgivable, a lot of people will have gone away thinking ‘This is too hard, I’m never going to be able to get this” and maybe walked away from what might have been a really fulfilling experience for them for life. I firmly believe in encouraging young people, trying to get the instruments playable for them. Trying to find the best entry level, starters packs and things like that that are quality, not just cheap. It astonishes me. £120, £150 you can get an acoustic with a solid top. You couldn’t have got that ten or fifteen years ago. I don’t want to sound like I’m advertising for Cort or anything, but they do a 12-string which is really quite easy to play, sounds great and it retails for 129 quid. It makes my job easier buying things in, because I can go ‘Yeah, I’d pay that. That’s really good value.’ Strangely enough, those are the things that seem to sell well. There’s no doubt you get a lot more for less money than you ever did. I suppose it’s down to the fact that most of it’s being made in China and Indonesia. There’s no point in us trampling all over each other’s territory. We’re all kind of in the same boat. We tend to have a pretty good relationship with the people in Wunjo’s. We’re in and out of each others’ places for spares and things like that. Most people, with some exceptions, tend to be reasonably friendly and we’re in it together. We send a lot of people to Rock Stop and they send a lot of people to us. We don’t keep a lot of guitar pedals and we keep a lot of hardware that they don’t keep. We try not to step on each others’ toes. We get on really well. It’ll be interesting to see who’s left at the end of the day and what exactly does happen with the street. I’ve heard people that say that they think that virtually all the shops are going to be gone in five years. That’s the question really. Will that be manageable for the kind of enterprises that are there now. The big concern is that all that anybody has to do really is put the rent up and wait. People will leave of their own accord if it doesn’t work. Probably [I would go] back out on tour [laughs]. I don’t know, er. I get offers. People want to poach me or offer me a workshop tied in with their businesses. That does happen, but I’m kind of part of the fixtures and fittings in this street. It wasn’t till I came back I realised how much I missed it. It wasn’t till I was standing outside having a cigarette – every five minutes somebody comes up to me and asks me the way to something and I know the answers, even though I haven’t been here for years. If I could find a way of making a small charge for all the people I direct to the British Museum or the Hard Rock Café I’d be in with a shot. Very interesting story about the Kinks. Did you ever give away guitar picks to the audience after the show? I remember one of the crew giving away picks after the show in Nagoya, Japan in 1995 tour. I recieved the pick! The guy looked quite like you! Found you me olwd mate , good luck for the future…. suppose it must be beero clock !!!!! Regards Martin Callaghan ps I still have laminates in the vault. Tom’s – a great part of the recent history of the street. My first Gibson was from Tom’s, nice old 1978 tobacco sunburst (second). Well worn and beautifully trod.